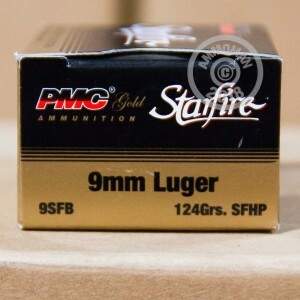 This standard pressure 9mm Luger ammunition from PMC's Starfire series is a great choice for compact carry pistols like the Ruger LC9, S&W M&P Shield, Springfield XDx, SIG P938, or Glock 26. 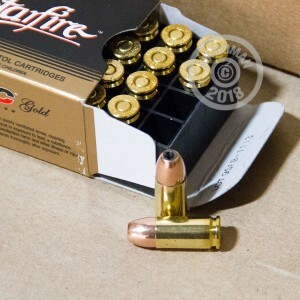 It fires a 124 grain jacketed hollow point bullet at around 1,100 feet per second and delivers excellent terminal performance without excessive recoil. Starfire ammunition uses special hollow point bullets with a ribbed design that provides simultaneous expansion and penetration. They are manufactured in South Korea by a leading defense contractor using non-corrosive Boxer primers and brass cases. Each box contains 20 cartridges. 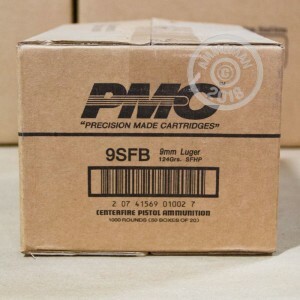 Shop at AmmoMan.com to get the best deals on ammunition--with free shipping for all orders over $99, you can stock up on the cheap with ease.